File this under "news you can use." Tarragon vinegar, which few of us have in our kitchens, is extremely versatile. It adds a wonderful flavour to many things you would never think of using it in. 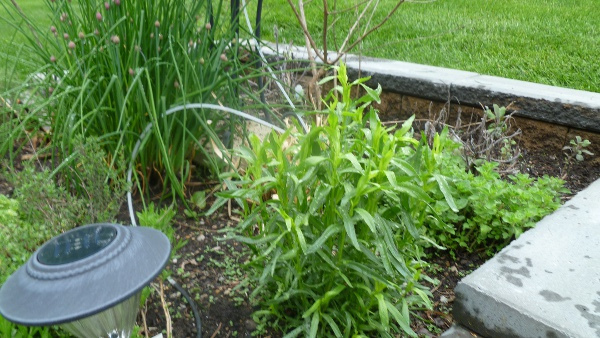 If you have purchased a tarragon plant or two and have it outside for the summer hopefully you will soon have more tarragon than you can deal with. So this post may be useful for some new ways for you to enjoy its wonderful flavour. Tarragon is one of the four fines herbes of French cooking, and goes particularly well with chicken, fish and egg dishes. Tarragon is a Eurasian herb related to wormwood and in the Aster family. The English name is from the French estragon, which means "little dragon." 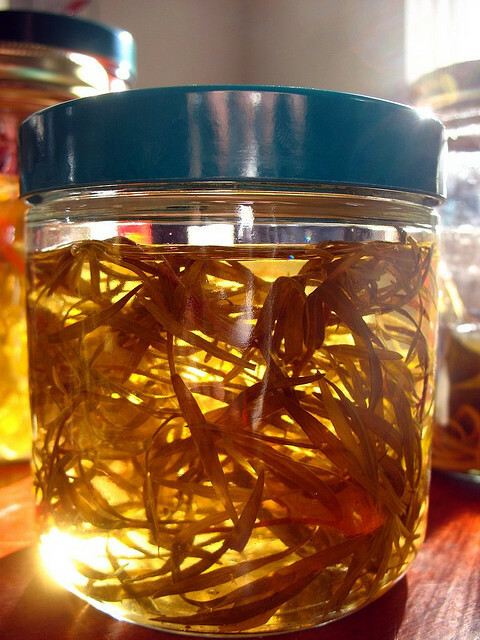 The herb is also known as dragon-wort. Both names probably derive from some ancient medicinal uses. There are three main types of tarragon: Russian, French and Mexican. Russian tarragon is more bitter, while French tarragon is sweeter and more anise-like. The French variety is the best for kitchen use. 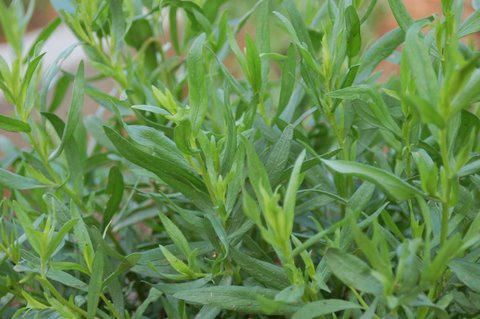 Mexican tarragon is often available in winter when French is no longer in season. Tarragon is not hardy in Nova Scotia, although in other areas it is a perennial herb. It is possible, with a sunny window, to grow tarragon all year round indoors in our region. In fact if you have enough sun, you could/should do the same with some of the other "staple" herbs such basil, oregano, parsley and chives, among others. A windowsill herb garden brings not only fresh herbs, but also joy, through the cold winter months. Tarragon vinegar is very easy to make and inexpensive, especially if you grow your own tarragon. if not, the amount you need to buy for this recipe won't break the bank. If you factor in the cost of the vinegar and herbs you still come out dollars ahead of purchasing it at a grocery store. Swirl it on top of gazpacho or other tomato soups. Use it to make mayonnaise for with hard boiled eggs or a cold seafood platter. Use it in place of white vinegar in pickles or canned tomatoes. Use it to kick start Bearnaise (a previous post) or tartar sauce. Simmer cubed chicken in about 1 cup of vinegar, then add a little cream and reduce. Use it as a base for vinaigrettes on salads. Tarragon complements both chicken and fish so be creative! You can scale this recipe up or down, depending on the volume of tarragon vinegar you wish to make. Remember, homemade vinegars make wonderful gifts. Just give yourself enough time to allow the vinegar to properly infuse. This isn't a "spur of the moment" recipe. Wash the tarragon and lemon zest well and pat dry with paper towels. Place in a clean, sterilized jar. Take a wooden spoon and bruise the leaves in the jar slightly. This helps release the essential oils. Bring the vinegar just to a boil in a sauce pan. Remove from the heat and pour the hot vinegar over the herbs in the jar. Seal and let age for 2-3 weeks to infuse in a dark place (like a cupboard). After aging, strain the vinegar through a wire mesh (like a permanent coffee filter) or the paper filter from a coffee maker. Any homemade vinegar should be used in six months if refrigerated; three if stored on the shelf.